A PHRASE is a small group of words standing together as a conceptual unit. A group of words with special meaning is called a PHRASE. A phrase can be effectively used to emphasize a point. The biggest difference between a native English speaker and the one who is not a native speaker is that the former has a much better vocabulary and can express his thoughts clearly. →I am going to take off. →I’ll hit the road now. यदि आपकी vocabulary strong है तो आपको कभी भी दूसरों के सामने अंग्रेजी में बात करने में संकोच महसूस नहीं होगा और साथ ही साथ आप बेहतर तरीके से अपनी बात और विचारों को express कर पाएंगे । एक अच्छी vocabulary होने का अर्थ सिर्फ शब्दों का ज्ञान नहीं होता है, it’s much more than that. Now, let’s explore a new way to improve the quality of our “spoken-English” abilities. Today we’ll take a small step and discuss some phrases related to the word CALL. →Call me back whenever you get time? →Due to some reasons, we had to call off this project. →My grandparents pay us a call every two months. →The atmosphere got a little tense after Sam called Amy’s bluff in front of everyone. →My father’s heart attack is a huge wake-up call for him about his unhealthy lifestyle. →Do not argue with me, I call the shots here. →The boss was mad because Tom called it a day at noon and went home. →The relationship had been going from bad to worse and we just decided it was time to call it quits. →My dance coach is a perfectionist and he calls me down on every little mistake that I make. →I called on George for his help, but he refused. 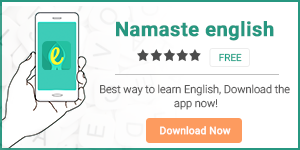 To learn more about how to improve your speaking skills, download our app Namaste English. Previous articleHow to interrupt, But Politely.